It's not unusual to see the latest, hottest PC games available for download at The Pirate Bay, the Swedish file-sharing website that's one of the planet's primary sources for pirated entertainment — just not normally on the very front page. 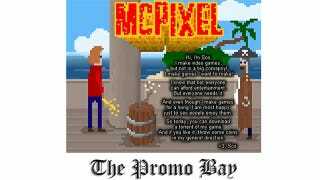 Mikolaj 'Sos' Kaminski's indie adventure game McPixel is available this weekend as a free torrent download, part of Pirate Bay "Promo Bay" promotion that spawned from the developer's odd reaction to initially seeing his game on the popularly piracy website. As chronicled at Reddit, when Sos found his game freely available for download, he didn't get angry. He got excited. In his excitement he thanked the downloaders for their interested, tossed a few codes for the full game into the comment thread, and the rest is Reddit history. The Pirate Bay reached out to Sos following the Reddit incident, and the two combined to create the "Promo Bay" special going on all weekend long. TPB has featured all sorts of independent artists in its "Promo Bay" section, but this is the first time a video game has been up for grabs. Players eager to give McPixel a try can download the torrent file for free all weekend long, paying what you think the game is worth after the fact. It's a nifty way for fans of the game to show a little extra support, and an opportunity for all the folks that claim they only download pirated games to see if they want to buy them a chance to put their money where their mouths are.